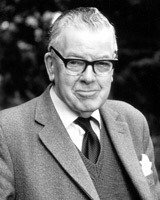 Frederick Fyvie Bruce FBA (12 October 1910 – 11 September 1990), usually cited as F. F. Bruce, was a biblical scholar who supported the historical reliability of the New Testament. His first book, New Testament Documents: Are They Reliable? (1943), was voted by the American evangelical periodical Christianity Today in 2006 as one of the top 50 books "which had shaped evangelicals". Bruce was born in Elgin, Moray, Scotland, the son of a Christian Brethren (Plymouth Brethren) preacher and educated at the University of Aberdeen, Gonville and Caius College, Cambridge, and the University of Vienna, where he studied with Paul Kretschmer, an Indo-European philologist. After teaching Greek for several years, first at the University of Edinburgh and then at the University of Leeds, he became head of the Department of Biblical History and Literature at the University of Sheffield in 1947. Aberdeen University bestowed an honorary Doctor of Divinity degree on him in 1957. In 1959 he moved to the University of Manchester where he became Rylands Professor of Biblical Criticism and Exegesis. He wrote over 40 books and served as editor of The Evangelical Quarterly and the Palestine Exploration Quarterly. He retired from teaching in 1978. Bruce was a scholar on the life and ministry of Paul the Apostle and wrote several studies, the best known of which is Paul: Apostle of the Free Spirit (published in the United States as Paul: Apostle of the Heart Set Free). He also wrote commentaries on many biblical books including Habakkuk, the Gospel of John, the Acts of the Apostles, Romans, 1 & 2 Corinthians, Galatians, Ephesians, Colossians, Philemon, 1 & 2 Thessalonians, Philippians, the Epistle to the Hebrews, and the Epistles of John. Most of Bruce's works were scholarly, but he also wrote many popular works on the Bible. He viewed the New Testament writings as historically reliable and the truth claims of Christianity as hinging on their being so. To Bruce this did not mean that the Bible was always precise, or that this lack of precision could not lead to some confusion. He believed, however, that the passages that were still open to debate were ones that had no substantial bearing on Christian theology and thinking. Bruce's colleague at Manchester, James Barr, considered Bruce a "conservative liberal". Bruce was a friend and colleague of H.L. Ellison. Bruce was in Christian fellowship at various places during his life, though his primary commitment was to the Open Brethren among whom he grew up. He enjoyed the fellowship and acceptance of this group, though he was very much a maverick in relation to his own personal beliefs. He never accepted a specific brand of dispensationalism usually associated with the Brethren, although he may have held a historic premillennialism akin to George Eldon Ladd and he was also an advocate of the public ministry of women – something that many Plymouth Brethren would still disapprove of today. Bruce was honoured with two scholarly works by his colleagues and former students, one to mark his 60th and the other to mark his 70th birthday. Apostolic History and the Gospel: Biblical and Historical Essays Presented to F. F. Bruce on his 60th Birthday (1970) included contributions from E. M. Blaiklock, E. Earle Ellis, I. Howard Marshall, Bruce M. Metzger, William Barclay, G. E. Ladd, A. R. Millard, Leon Morris, Bo Reicke, and Donald Guthrie. Pauline Studies: Essays Presented to Professor F. F. Bruce on his 70th Birthday (1980) included contributions from Peter T. O'Brien, David Wenham, Ronald E. Clements, and Moisés Silva. C. F. D. Moule and Robert H. Gundry contributed to both volumes. Bruce was elected a Fellow of the British Academy, and in 1965 served as President of the Society for Old Testament Study, and also as President of the Society for New Testament Study. Bruce, F. F. (1943). Are the New Testament Documents Reliable?. Downers Grove, IL: InterVarsity Press. OCLC 558247493. - republished as New Testament Documents: Are They Reliable? ——— (1951). The Acts of the Apostles: The Greek Text With Introduction and Commentary (1st ed.). London: Tyndale Press. OCLC 555539952. ——— (1952). The Acts of the Apostles: The Greek Text With Introduction and Commentary (2nd ed.). London: Tyndale Press. OCLC 555539952. ——— (1955). The Book of the Acts. New International Commentary on the New Testament. Grand Rapids, MI: Eerdmans. OCLC 36238079. ———; Simpson, Edmund K. (1957). The Epistles to the Colossians and the Ephesians. New International Commentary on the New Testament. Grand Rapids, MI: Eerdmans. OCLC 814437503. - Bruce wrote the Colossians commentary, and Edmund K. Simpson wrote the Ephesians commentary; see the 1984 replacement below entirely by Bruce. ——— (1959). The Apostolic Defence of the Gospel. London: Inter-Varsity Press. OCLC 752714965. ——— (1962). Paul and his Converts: 1 and 2 Thessalonians, 1 and 2 Corinthians. Bible guides. 17. Cambridge, UK: Lutterworth Press. OCLC 1070713. ——— (1963). The English Bible: a history of translations from the earliest English versions to the new English bible. London: Methuen. OCLC 247461547. ——— (1963). The Epistle of Paul to the Romans: an introduction and commentary. Tyndale New Testament Commentaries. London: The Tyndale Press. OCLC 923307860. ——— (1963). Israel and the Nations: from the Exodus to the fall of the Second Temple. Exeter: Paternoster Press. ISBN 9780853641506. OCLC 803956125. ——— (1964). Epistle to the Hebrews. New International Commentary on the New Testament. Grand Rapids, MI: Eerdmans. ISBN 9780802823168. OCLC 21194883. ——— (1965). An Expanded Paraphrase of the Epistles Of Paul. Exeter: Paternoster Press. OCLC 557807782. ——— (1966). The Spreading Flame. The Paternoster Church History. 1. =Exeter: Paternoster Press. OCLC 251857737. ——— (1969). New Testament History. London: Oliphants. ISBN 9780551005112. OCLC 613833907. ——— (1970). The Epistles of John. London: Pickering & Inglis. ISBN 9780720800524. OCLC 148762. ——— (1971). I & II Corinthians. New Century Bible. London: Oliphants. ISBN 9780802818393. OCLC 865488780. ——— (1972). Answers to Questions. Exeter: Paternoster Press. ISBN 0-85364-101-3. OCLC 468662165. ——— (1972). The Message of the New Testament. The Christian Student's Library. 10. Exeter, UK: Paternoster. ISBN 9780853641285. OCLC 751551126. ——— (1974). Jesus and Christian Origins Outside the New Testament. London: Hodder and Stoughton. ISBN 9780340158685. OCLC 301397862. ——— (1979). Men and Movements in the Primitive Church. Exeter: Paternoster Press. ISBN 9780853642794. OCLC 230045030. ——— (1981). The Epistle of Paul to the Galatians: a commentary on the Greek text. New International Greek Testament Commentary. Grand Rapids, MI: Eerdmans. ISBN 9780802823878. OCLC 824666199. ——— (1982). Bible History Atlas. New York: Crossroad. ISBN 9780824504182. OCLC 8610749. ——— (1982). 1 & 2 Thessalonians. Word Biblical Commentary. 45. Waco, TX: Word Books. ISBN 9780849902444. OCLC 8808232. ——— (1983). Hard Sayings of Jesus. Jesus library. London: Hodder and Stoughton. ISBN 9780340270448. OCLC 869192514. ——— (1983). The Gospel of John. Grand Rapids, MI: Eerdmans. ISBN 9780802834072. OCLC 10923759. ——— (1983). Philippians. New International Biblical Commentary. Peabody, MA: Hendrickson. ISBN 9780943575155. OCLC 808517296. ——— (1986). Jesus: Lord & Savior. Downers Grove, IL: InterVarsity Press. ISBN 9780877849322. OCLC 1056613843. ——— (1986). The Epistle of Paul to the Romans: an introduction and commentary. Tyndale New Testament Commentaries. 6. Grand Rapids, MI: Eerdmans. ISBN 9780802800626. OCLC 895415117. ——— (1988). The Canon of Scripture. Downers Grove, IL: InterVarsity Press. ISBN 9780830812585. OCLC 690640649. ——— (1988). The Book of the Acts. New International Commentary on the New Testament (Revised ed.). Grand Rapids, MI: Eerdmans. ISBN 9780802824189. OCLC 17620016. ——— (1990). Epistle to the Hebrews. New International Commentary on the New Testament (Revised ed.). Grand Rapids, MI: Eerdmans. ISBN 9780802825148. OCLC 494366569. ——— (1990). The Acts of the Apostles: The Greek Text With Introduction and Commentary (3rd revised & expanded ed.). London: Apollos. ISBN 9780851117645. OCLC 277179500. ——— (1990). A Mind For What Matters: collected essays of F.F. Bruce. Grand Rapids, MI: Eerdmans. ISBN 9780802804464. OCLC 21974720. ———; Kaiser, Jr., Walter C.; Davids, Peter H.; Brauch, Manfred T. (1996). Hard Sayings of the Bible. Downers Grove, IL: InterVarsity Press. ISBN 9780830814237. OCLC 35084532. ——— (March 1961). "The Book of Zechariah and the Passion Narrative". Bulletin of the John Rylands Library. 43 (2): 336–353. ——— (March 1962). "Christianity Under Claudius". Bulletin of the John Rylands Library. 44 (1): 309–26. ——— (March 1963). "When is a Gospel not a Gospel?" Bulletin of the John Rylands Library". 45 (1): 319–39. ——— (March 1964). "St. Paul in Rome. 1". Bulletin of the John Rylands Library. 46 (2): 326–45. ——— (Autumn 1965). "St. Paul in Rome. 2. The Epistle to Philemon". Bulletin of the John Rylands Library Manchester. 48 (1): 81–97. ——— (Spring 1966). "St Paul in Rome. 3. The Epistle to the Colossians". Bulletin of the John Rylands Library Manchester. 48 (2): 268–285. ——— (Spring 1967). "St. Paul in Rome. 4. The Epistle to the Ephesians". Bulletin of the John Rylands Library Manchester. 49 (2): 303–322. ——— (Spring 1968). "St, Paul in Rome. 5. Concluding Observations". Bulletin of the John Rylands Library Manchester. 50 (2): 262–279. ——— (Spring 1969). "Galatian Problems. 1. Autobiographical Data". Bulletin of the John Rylands Library Manchester. 51 (2): 292–309. ——— (Spring 1970). "Galatian Problems. 2. North or South Galatians?". Bulletin of the John Rylands Library Manchester. 52 (2): 243–266. ——— (Spring 1971). "Galatian Problems. 3. The 'Other' Gospel". Bulletin of the John Rylands Library Manchester. 53 (2): 253–271. ——— (Spring 1972). "Galatian Problems. 4. The Date of the Epistle". Bulletin of the John Rylands Library Manchester. 54 (2): 250–267. ——— (Spring 1973). "Galatian Problems. 5. Galatians and Christian Origins". Bulletin of the John Rylands Library Manchester. 55 (2): 264–284. ——— (1974). "Paul and the Historical Jesus". Bulletin of the John Rylands University Library of Manchester. 56: 317–335. ——— (Spring 1975). "Paul and the Law of Moses". Bulletin of the John Rylands Library of Manchester. 57 (2): 259–279. ——— (Autumn 1977). "Christ and Spirit in Paul". Bulletin of the John Rylands Library of Manchester. 59 (1): 259–285. ——— (Spring 1978). "St. John At Ephesus". Bulletin of the John Rylands Library Manchester. 60 (2): 339–361. ——— (1979). "St. Paul in Macedonia". Bulletin of the John Rylands University Library of Manchester. 61 (2): 337–354. ——— (Spring 1980). "St. Paul In Macedonia: 2. The Thessalonian Correspondence". Bulletin of the John Rylands Library of Manchester. 62 (2): 328–345. ——— (Spring 1981). "St. Paul in Macedonia: 3. The Philippian Correspondence". Bulletin of the John Rylands Library of Manchester. 63 (2): 260–284. ——— (Autumn 1982). "Acts of the Apostles To-Day". Bulletin of the John Rylands Library of Manchester. 65 (1): 36–56. ——— (Spring 1983). "Some Thoughts on the Beginning of the New Testament Canon". Bulletin of the John Rylands University Library of Manchester. 65 (2): 37–60. ——— (Spring 1984). "Paul and 'The Powers That Be'". Bulletin of the John Rylands Library of Manchester. 66 (2): 78–96. ——— (Spring 1985). "The Church of Jerusalem in the Acts of the Apostles". Bulletin of the John Rylands Library of Manchester. 67 (2): 641–661. ——— (Spring 1986). "Chronological Questions in the Acts of the Apostles". Bulletin of the John Rylands Library of Manchester. 68 (2): 273–295. ——— (Spring 1987). "Paul's Apologetic and the Purpose of Acts". Bulletin of the John Rylands Library of Manchester. 69 (2): 379–393. ^ Grass, Tim (2012). F. F. Bruce: A Life. Milton Keynes: Paternoster. p. 40. ISBN 978-0-8028-6723-0. ^ Hippenhammer, Craighton T., "F.F. Bruce: A Life, by Tim Grass" (2013). Faculty Scholarship – Library Science. Paper 15. http://digitalcommons.olivet.edu/lsci_facp/15. ^ W.W. Gasque, "Bruce, F(rederick) F(yvie)", Historical Handbook of Major Bible Interpreters, ed. Donald K. McKim, InterVarsity Press, 1998, p. 444. ^ "F. F. Bruce a life". The Gospel Coalition. Retrieved 17 December 2015. ^ Iain Murray, Evangelicalism Divided, Edinburgh: Banner of Truth (2000), p. 181; John Wenham, Facing Hell: An Autobiography, Carlisle: Paternoster Press (1999), p. 195. ^ Arnold Pickering, "F.F. Bruce as a Fellow-Elder", Christian Brethren Research Fellowship Journal 22 (Nov. 1971), p. 15f. ^ F.F. Bruce, "The End of the First Gospel", The Evangelical Quarterly 12 (1940), pp. 203–214. ^ Grass, Tim (2012). F. F. Bruce: A Life. Milton Keynes: Paternoster. pp. 37–38. ISBN 978-0-8028-6723-0. ^ Grass, Tim (2011). F. F. Bruce: A Life. Grand Rapids: Eerdmans. p. 229. ISBN 9780802867230. ^ "The Hittites and the Old Testament" (PDF). Retrieved 13 March 2019. ^ "Second Thoughts on the Dead Sea Scrolls". Retrieved 11 April 2019. ^ "The Teacher of Righteousness in the Qumran Texts" (PDF). Retrieved 13 March 2019. ^ "Biblical Exegesis in the Qumran Texts" (PDF). Retrieved 13 March 2019. ^ "The 'Secret' Gospel of Mark" (PDF). Retrieved 15 March 2019. ^ "The Speeches In Acts: Thirty Years After" (PDF). Retrieved 13 March 2019. ^ "The Background to the Son of Man Sayings" (PDF). Retrieved 13 March 2019. ^ "The Curse of the Law" (PDF). Retrieved 13 March 2019. ^ "The Chester Beatty Papyri" (PDF). Retrieved 13 March 2019. ^ "What Do We Mean By Biblical Inspiration?" (PDF). Retrieved 13 March 2019. ^ "Colossian Problems: Part 1: Jews and Christians in the Lycus Valley". Retrieved 13 March 2019. ^ "Colossian Problems: Part 2: The 'Christ Hymn' of Colossians 1:15–20". Retrieved 13 March 2019. ^ "Colossian Problems: Part 3: The Colossian Heresy". Retrieved 13 March 2019. ^ "Colossian Problems: Part 4: Christ as Conqueror and Reconciler". Retrieved 13 March 2019. ^ "Luke's Presentation of the Spirit in Acts". Retrieved 13 March 2019.